The topic for the 2015 European School on Magnetism is From basic magnetic concepts to spin currents, part of the Series of the European School on Magnetism. The School will take place from Aug. 24th to Sep. 4th 2015 in Cluj-Napoca, Romania. Like previous editions of ESM, the 2015 School aimed at providing a thorough understanding of magnetism based on a broad series of fundamental lectures, while offering the latest insights into up-to-date aspects of magnetism with lectures focusing on a special topic. The topic covered in 2015 was spintronics, with a special emphasis on Spin currents. This covers a wide range of fundamental phenomena in condensed matter physics, and opportunities for applications. The detailed topics to covered were: basic concepts, magnetism in matter, thermal effects and magnetization processes, transport phenomena, spin-transfer effects, effects of electric field, spin currents, caloritronics etc. The School is addressed at young scientists, mainly PhD students and post-docs, both experimentalists and theoreticians. It consisted of a ten-day training of lectures and practicals provided by prominent scientists active in today's research, interactive question sessions, access to a library of magnetism-related books, and industrial contributions. Slides of the lectures are available on-line. See also our extensive repository of lecture slides since 2003. 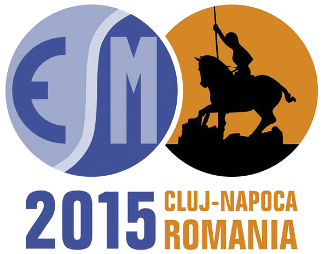 ESM 2015 was held succesfully in Cluj-Napoca, Romania, with topic "From basic magnetic concepts to Spin currents". It gathered 110 participants, with a vast majority of PhD students. These came from 29 countries mostly in Europe, however with a few participants from Japan, Korea, India, Mexico, Israel... All appreciated this lively melting pot, with 37 nationalities present. As for previous School, activities consisted in lectures (40h), question sessions (8h), access to a Library on Magnetism, and practicals (4-6h). The latter comprised ab initio calculations, spin numerical models, magnetic force microscopy, and exercises on units, model of ferromagnetism, spin currents, Rashba effects, conneciton of experiments with theory. Subscribe to the mailing list to stay tuned for the future Schools. This Web site is hosted and maintained by Institut Néel. The following organizations provided financial and/or technical support to the European School on Magnetism (confirmed or pending).